Brian Cashman’s Pet Sematary | That's Twins Baseball. A Minnesota Twins Blog. The Yankees are well known for their ability to go out and buy the top shelf free agents available while the Twins usually go searching through the recycling bin. This season is different. The Yankees finally didn’t land that big fish in free agency. Cliff Lee decided to go to the Phillies for less money than what the Yankees were offering. I think the Yankees and GM Brian Cashman are still recovering from being turned down. Kinda like that hot girl in high school who can get any guy she wants but finally somebody turns her down (hypothetically speaking of course). The Yankees blew through some money to pick up setup man Rafael Soriano (3yr/$35M) but the biggest offseason news may be what was built behind Yankee Stadium. 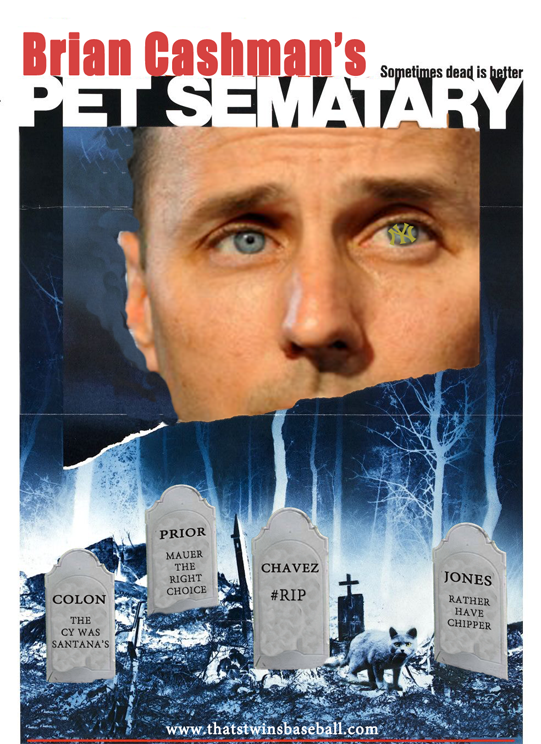 Cashman built a Pet Sematary, and then went out and signed some corpsey free agents to plant. The Yankees ended up signing the likes of Bartolo Colon, Andruw Jones, Eric Chavez, and the often injured Mark Prior. While each player in their prime would be a typical Yankee free agent signing, the strategy of grabbing them after their career has perished is quite original. The Twins should look into building one of these for the playoffs since they always play dead in October (tough love, sorry). Watch out for a little boy with a scalpal. Achilles injury coming. Should the “Twins Way” Go Away?